Given Leica's heritage the company's M–series cameras need no introduction. In this day and age, however, they are rather controversial products: whereas some maintain that they are as relevant to photography today as they were several decades ago, and that there are things that can be done with a Leica M only, others believe they are nothing but overpriced, idiosyncratic archaisms meant for snobs and camera collectors (particularly the special edition series). Whichever the case—and the truth always tends to be somewhere in the middle—this controversy certainly arouses curiosity. So when a friend offered me to use his Leica M9 with a Summicron–M 2/35 ASPH lens for a week to see what I would think of it, I jumped at the opportunity without thinking twice. After the M9 became my temporarily inseparable companion, the very first thing that I noticed was that people looked at me—or, rather, at the camera—more often than when I carry my Nikon D700 (which is a noticeably larger camera); this impression was further reinforced during the rest of the days with the camera. I reckon this is because everyone is used to seeing DSLR cameras—they are sort of a part of the usual circumstance and thus are not worth paying special attention. With a Leica M camera, however, it is different: those who do not know what it is have to look at it because it has very peculiar looks; and those who know what a Leica camera is cannot not look, because they either aware of its heritage or know how much it costs. On one occasion someone even approached me to ask if it was a real Leica and, when I answered that it actually was, whether it was an old classic or the new digital prodigy. So much for the myth of Leica cameras being unobtrusive and unnoticeable—it might have been true then and there, and you know what they say about stepping into the same river twice. As soon as I laid my hands on the M9 I, naturally, could not help but take a peek at what the world looks like through the viewfinder of a Leica M camera. At the risk of dissapointing you, no massive surprises here—you see the same good old world, and your impression of the quality of the viewfinder will largely depend on what kind of cameras you have used. If you have only shot with DSLR cameras with smaller than full–frame sensors you most likely will be impressed. I, however, currently use a full–frame Nikon D700 and a Hasselblad 503CW camera. Given what I am used to, I find the viewfinder of the M9... okay. On the upside, it is fairly large and bright. However, the bright–line frames corresponding to different focal lengths were optimised for subjects at one metre and framing at longer distances (which will be most of the time for the vast majority of photographers) is very inaccurate. Also on the downside, eye relief is very poor: if you wear glasses you will not be able see the entire bright–line frame corresponding to even 35mm, leave alone shorter focal lengths. Next on, focusing. I used rangefinder cameras in the past and generally do not find rangefinder focusing particularly difficult (nor do I find it exceedingly pleasant, though). Focusing the M9 with the Summicron–M 2/35 ASPH lens, however, is more difficult than it has to be. The lens has a dedicated focusing lever attached to the focusing ring and focusing ring itself is perfectly smooth. Focusing with the lever is somewhat jerky and does not work well for quick accurate focusing; quick accurate focusing is possible with the focusing ring, but it is not easy to grasp firmly as it is not ribbed. Focusing in darker conditions is even more challenging. To put things into perspective, it was nearly impossible to focus the camera in a fairly dimply–lit pub. As a point of comparison, I took my Nikon D700 with the AF Nikkor 35mm f/2D lens to the same pub on a number of occasions and the camera did not have any difficulties auto–focusing the lens. The M9 is fairly small and easy to carry around your neck or on your shoulder for extended periods of time. It is very solidly built—like the proverbial brick—and the quality of its construction certainly inspires confidence. Unfortunately, the camera handles like a heavy brick, too, and I did not find it particularly ergonomic. The M9 is quite heavy given its size and grasping the camera with your right hand for shooting feels neither comfortable nor secure: there is no grip of any kind at the front of the camera and nowhere for your thumb to securely rest at the back. An add–on grip such as the Thumbs Up CSEP–1 significantly improves handling of the camera, but then again using additional accessories would be cheating for Leica purists, would not it? Second, when I hold the camera to review images on the LCD screen or change settings in the menus, my left hand pointing finger invariably lands on the viewfinder window at the front of the camera, which thus needs constant cleaning or, otherwise, ends up being permanently smeared. The LCD screen at the back of the camera (2.5" TFT LCD with 230,000 pixels) is rather subpar by today's standards. It serves sufficiently well to make adjustments in menus or view the histogram after taking a shot, but is clearly inadequate to make aesthetic judgment of images. Also, it has been reported that the LCD cover glass is made of Perspex and scratches quite easily, which I find unacceptable for a camera that costs an arm and a leg. Battery life is inadequate, too. You will be lucky to get 300 shots on one fully charged battery, and I am actually giving it the benefit of the doubt—I only managed to barely get past two hundred shots. The M9 is not exactly a speed demon. There is a short yet noticeable and in some situations annoying start–up lag—even in my short time with the camera I found it quite frustrating and lost a couple of shots because of it (those were not great shots, but I did mean to take them). In continuous shooting mode the M9 shoots at 2 frames per second, but when shooting in DNG format it can only take seven shots until the buffer is full and needs to clear. Image review and magnification is not exactly speedy either. High ISO image quality is not the M9's strongest selling point. I first thought of posting crops of test shots at 100% but then decided to scrap the idea because, given the nature of this article, it would be an overemphasis on something that is not expected to be the most critical performance factor of the M9. Let me just say that my impression was that I did not want to go beyond ISO1250 unless I really had to; further, I find ISO2500 barely usable (but then again, I have fairly high standards). I have read suggestions on better Web sites that the M9 might be a good choice for landscape photography. Personally, I fail to see how this can be the case, because there is no tilt/shift possibility with the M–series Leica cameras and use of filters (polarising or graduated neutral density in particular) is awkward at best. Sure, the M9 might work for landscape photography, but this is not dissimilar to saying that anything might work for landscape photography. So what aspects of the M9 stand out and make it a unique camera that tramps other choices? First, it is the camera's simplicity, which I am all in for. Aperture is controlled with the aperture ring on the lens, and shutter speed is set via a dedicated dial on the top panel of the camera. The shutter speed dial can be set to either a concrete shutter speed or to auto mode; the M9 thus has two shooting modes: manual and aperture priority. Viewfinder information is simple, too (some might suggest that "rudimentary" is a more appropriate word, though). Exposure compensation and Auto–ISO function are implemented in a straightforward way, too. Menus are also very simple yet seem to contain everything that a serious photographer might need, and Leica is to be applauded for not cluttering them with unnecessary features. While talking of menus I have to note that, quite strangely, some of them cannot be cancelled by simply pressing another menu button. For example, if you press the SET button while in the shooting mode to, say, change exposure compensation, you then cannot simply press the PLAY button to start reviewing images—to do so, you first must cancel the SET menu by half–pressing the shutter release button and then press the PLAY button to start viewing images. One could probably get used to this, but I found this somewhat counterintuitive. The second aspect where the M9 clearly shines is image quality at the base ISO setting (ISO160). The sensor of the M9 boasts 18.5 megapixels, which is a very respectable resolution and will remain such for a few years to come. Dynamic range appears very impressive. As you most likely know, the CCD sensor does not have an anti–aliasing filter in front of it and, as has been widely reported, its resolution equals that of cameras with higher resolution from Nikon, Canon and Sony. Also, pixel–level sharpness and integrity are absolutely superb. 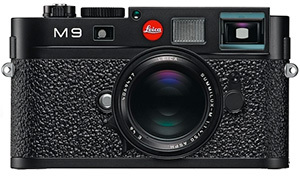 In short, as of late 2010 the M9 offers state–of–the–art image quality in 35mm full–frame format that comes in the smallest camera body by far. You probably expect a long list of things where the M9 excels but, alas, image quality at ISO160 and the camera's simplicity are the only two aspects that really appealed to me. But wait, you say, what about the Leica "mystic" and shooting ethos? I imagine that for some, especially those who have been using Leica M cameras for a long time, it is a tangible notion, if not the primary reason to get a digital Leica in the first place. For many, however—yours truly included—it is more of a poetically exaggerated metaphysical construction. Granted, the camera's numerous limitations do force you into a certain modus operandi and impose specific shooting approaches, but so do many other cameras (albeit each does so in a different manner). For instance, I could wax poetic for a long time about the ethos of using a fully mechanical Hasselblad V–series camera. Enjoying and even purposefully pursuing a given shooting ethos can be a personal preference and I fully respect that; however, trying to mystify idiosyncrasies of a camera system or present them as raison d'être is quite a bit of a stretch. They just do not pass as an all–around advantage in my book. At the end of the day I feel that the Leica M9 is a very eccentric camera that offers a few very unique advantages on the one side of the equation and a longish list of limitations and subpar performance in some aspects on the other. The degree of importance or irrelevance of each side of the equation is, of course, to be determined by each photographer depending on his photographic background and priorities. Although personally I was not exactly enchanted with the Leica M9 I, nonetheless, very much welcome its existence—it is always great to have more options for varied photographic needs and approaches. And of course, it would be utterly boring to live in a world filled with run of the mill cameras only.